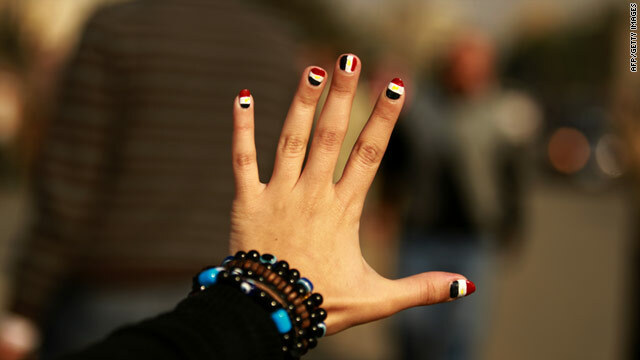 An Egyptian girl flashes her nails painted with the colors of her national flag in Cairo's Tahrir Square. Editor's note: CNN producer and camerawoman Mary Rogers has lived and worked in Egypt since 1994. She joined CNN in 1981 and has covered conflicts in Somalia, Sierra Leone, the Congo, Iraq, Chechnya, Israel, Gaza, the West Bank, Lebanon and Afghanistan. Recently she filmed the uprising in Tunisia. Cairo, Egypt (CNN) -- Several months before the revolution, I wrote a piece for CNN.com on the sexual harassment of women in Cairo. News of the chilling attack on CBS reporter Lara Logan, as well as other sexual assaults against women during Egypt's uprising, show that attacks against women have not gone away. I speak from experience. While most of my days covering Tahrir Square during the last few weeks were free from harassment, there was one day when I was groped. Another colleague almost had her pants ripped off by a gang of thugs. If you are a woman living in Cairo, chances are you have been sexually harassed. It happens on the streets, on crowded buses, in the workplace, in schools, and even in a doctor's office. According to a 2008 survey of 1,010 women conducted by the Egyptian Center for Women's rights, 98 percent of foreign women and 83 percent of Egyptian women have been sexually harassed. It happens on the streets, on crowded buses, in the workplace, in schools, and even in a doctor's office. Before I could respond, they were gone, but I noticed policemen nearby bursting with laughter. I am old enough to be those boys' mother, I thought. This incident was minor compared to what happened in 1994, shortly after I moved here. It was winter, and I was walking home from the office, dressed in a big, baggy sweater, and jacket. A man walked up to me, reached out, and casually grabbed my breast. In a flash, I understood what the expression to "see red" meant. I grabbed him by the collar and punched him hard in the face. I held on to him, and let out a stream of expletives. His face grew pale, and he started to shake. "I'm sorry. I'm sorry," he whispered. But the satisfaction of striking back quickly dissipated. By the time I walked away, I was feeling dirty and humiliated. After a couple of years enduring this kind harassment, I pretty much stopped walking to and from work. Of course, harassment comes in many forms. It can be nasty words, groping, being followed or stalked, lewd, lascivious looks, and indecent exposure. At times it can be dangerous. This is what a friend told me happened to her: "I remember I was walking on the street, when a car came hurtling towards me. Aiming for me! At the last minute he swerved, then stopped, and finally laughed at me. I learned later that it was a form of flirting." Why is sexual harassment in Egypt so rampant? There could be any number of reasons, but many point to disregard for human rights. Before the uprising, Nehad Abu el Komsan, the Director for the Center for Women's Rights, told me that Egypt was more interested in political than public security. She said that often meant that officials focused more on preventing political unrest than addressing social ills. Some also blame the spread of more conservative interpretations of Islam from the Gulf over the past 30 years. They say such interpretations demand more restrictive roles for women and condemn women who step outside of those prescribed roles. Perhaps it will be people power, the same people power that brought down a regime, that will successfully combat sexual harassment. "Four million Egyptians went to the Gulf," el Komsan said. "They returned with oil money, and oil culture, which is not very open, related to the status of women. All of this changed the original culture of the Egyptian," she adds, "which included high respect for women." Sara, a young Egyptian activist, told me that the concept of respect for some reason doesn't exist any more. "I think Egypt has lived a very long time in denial. Something happened in Egyptian society in the last 30 or 40 years. It feels like the whole social diagram has collapsed." What is being done to raise awareness and combat such behavior? A law regarding sexual harassment will have to wait. The country has greater concerns now -- forming a new government; writing a new constitution; getting Egypt's economy going again and dealing massive unemployment, among other things. The military is in charge now, and who knows when Egypt will get a new president, or parliament. In the past, women who have been sexually harassed here have been too afraid or ashamed to speak up. That is changing slowly. In 2008, in a landmark court case, a man was sentenced to three years of hard labor for grabbing the breast of Noha Rushdi Saleh, a brave woman determined to seek justice. The trial was covered extensively in the Egyptian press, and brought the problem of sexual harassment out in the open. A group of young idealists are taking a personal initiative in trying to combat sexual harassment. They are handing out pamphlets now saying: "Don't take bribes, don't drive the wrong way on a one way street, and don't sexually harass women." Perhaps it will be people power, the same people power that brought down a regime, that will successfully combat sexual harassment. But the only real protection women can have is when the attitudes of men change. The opinions expressed in this commentary are solely those of Mary Rogers.